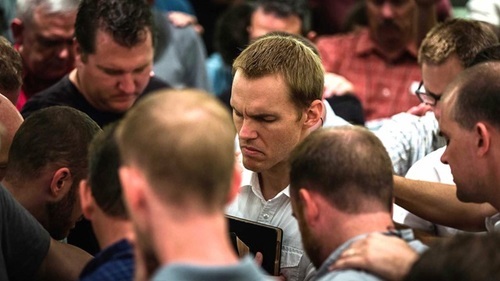 David Platt & Raising The Dead: Is The SBC Going Full Benny? I doubt seriously that, though the acronym fits, it’s a duly inspired move of God. But we’re seeing just enough in the SBC of late to wonder if “Slowly Becoming Charismatic” hasn’t been a spot-on, if not previously used in critical, admonishing jest, preview of denominational things to come. It’s certainly worth pondering, particularly if you find yourself sitting in an SBC pew. Having won – rightly and laudably so – the fist-pump-worthy “battle for the Bible” in its not too distant past, the SBC’s current incarnation has seen that Bible all but placed on a bookshelf to occasionally be pointed at but its pages hardly ever delved for direction or deeper truth. In many SBC churches, authentic sheep aren’t edified by the Word; more often they’re entertained by verse-plucked platitudes, frequently accompanied by mantra-like 7-11 tunes intended to pander to pew-sitting goats. If it were a casino, they’d be pumping in pure oxygen to facilitate an engaged and continued “high;” in the SBC, they do it with “you” centered sermons and pop praise tunes. All that’s lacking is a one-armed handle on that offering plate, it seems. The “bring ‘em in and entertain ‘em” model of doing church may be all too typical in the SBC, but lacking the Word preached and properly handled, the only thing the SBC has going for it is hyped-up, platitude-driven emotionalism that is often eerily close to a qualified form of universalism. If you walk this aisle, say this prayer, take a trip through our baptistry, praise God! You’ve got a free ticket to heaven. Please take a pew and pass the one-armed bandit …err, offering plate and show your love to the Cooperative Program … err, to Jesus. Salvation is easy, the pews are comfortable, and the stage-show promises to entertain. Please come back next week. What’s often bandied forth from the sleek, pulpit-less dais is a thinly veiled prosperity gospel that would not be unfamiliar if heard coming from the lips of Kenneth Copeland or his counterpart “Christian” TV charlatans. Throw in some tambourines, a few head-smacking healing attempts, let some folks start slobbering nonsense in a frenzied vocal froth and you’ve got yourself the makings and markings of Holy Ghost charisma. Of course, the hallowed “seed faith” gift so popular among the TBN types would probably not be so monikered in the SBC; there’s too much vestigial value in the corrupt Cooperative Program, but “the Cooperative Seed Faith & Blessing Program” does have some charismatic marketing pizzazz, doesn’t it? But seriously, is the SBC going full-Benny? You might recall about a year ago when David Platt, then the not too newly named President of the International Mission Board, oversaw a reworking of the agency’s missionary qualifications standards. While dealing with a redress of such things as divorce and teenage children being sent offshore, the agency also chose to make a change regarding tongues. And no, those “tongue” changes had nothing to do with subscribing would-be missionaries to the Rosetta Stone in order to teach them Swahili. Though changing the previous requirements that precluded from consideration an applicant who engaged in tongues or a private prayer language, Platt made sure to point out, via Baptist Press, that the leniency being implemented with speaking in tongues was not really a big deal. Platt claimed the change brought the agency into more deft alignment with the Baptist Faith & Message, a statement of faith he SBC adheres to with about as much vigor as it does to Scripture. 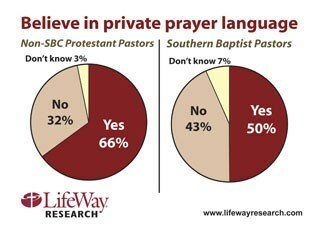 The previous policy on tongues and private prayer languages “went beyond some of the language in the Baptist Faith and Message,” Platt said. Previously, IMB policy defined the gift of tongues, or glossolalia in Greek, as speaking “a legitimate language” and disqualified from service all missionary candidates who used an unintelligible language in worship or practiced glossolalia in worship without following the New Testament guidelines. Using an “ecstatic utterance as a prayer language” disqualified a candidate from service. There was just one problem with the agency’s adjustment to the policy, which, according to Platt, “went beyond” the BF&M. The Baptist Faith and Message does not speak either to tongues or private prayer languages. It simply makes no mention of the matter. How then could the IMB’s previous policy have gone beyond acceptable Baptist guidelines? Hmmm. Why attribute the change to that? Is some denominational subterfuge afoot? Was the agency’s shift on tongues a subtle warning shot of things to come within the SBC, things of a distinctly more doctrinally-lenient nature? After all, with the ongoing massive hemorrhaging of membership from the SBC, (How hard is it to just “preach the Word” and actually trust Jesus to “build my church?”) it would be awfully hard to sit in the ivory towers of the CP funded SBC and not look covetously on the dramatic growth of the charismatic movement across the globe. Pentecostalism and charismatic churches, self-describing as “Christian,” are second only in global adherents to that other “Christian” denomination, the Roman Catholic Church. The SBC sure could use some pew-fillers, even those who may occasionally be frothy-lipped and prone to particular ecstatic excitements, perhaps. While most in the SBC who fear the abominable threat of a split to arrive on the divisive – and kept at the forefront – basis of Calvinism vs Arminianism, what actually may be the more virulent undercurrent of a looming split is the issue of the denomination’s orthopraxic acceptance and implicit doctrinal allowance of charismania. It’s difficult, if not nigh impossible, to give laudatory lip service to Scripture’s sufficiency out of one side of the mouth while foaming incoherently out of the other side in complete disregard to it. Cessationists (those who believe the charismatic “gifts” have ceased) vs continuationists (those who believe those “gifts” continue today) are about equally represented in the SBC, indicating, of course, that fully half are wrong. In a study released by LifeWay in 2007, a full 50 percent of polled SBC pastors answered the following question in the affirmative. With half of pastors agreeing on a clearly unbiblical pursuit, the overt conspiracy of charismania is supported throughout the SBC in other obvious places. The now perennial bestseller at LifeWay is the Scripturally noxious, extra-biblical musings of Sarah Young. (Her extra-biblical heresy is, of course, the Jesus Calling book franchise.) Wonder why more pastors don’t fight off this glaringly evident wolf from prowling their flocks? They likely agree with its premise … God speaks outside His Word in a direct, you-can-write-this-down-over-your-morning-latte sort of way. When you turn on TBN or Daystar of some other such illicitly named “Christian” television, the charismaniacal charlatanry is accompanied by the full-throated proclamation of a false, damning prosperity gospel. The Sunday morning fluff spewed from most SBC pulpits isn’t all that far removed from the messages of Benny Hinn or Kenneth Copeland. When the worship “experience” looks more like a choreographed stage show than one honoring our Sovereign God in reverence and awe (Hebrews 12:28) and is accompanied by a message that’s all about you, not Christ, that smells like the tempting aroma of a sizzling, waiting to be served slice of prosperity gospel. The SBC pastor proclaiming prosperity-lite merely restrains himself from the absolute promise of health, wealth, and success guaranteed by twisted interpretations of the Word, your professed utterances of your own ginned-up “faith,” and founded , of course, on the basis of your seed faith sowing. It ain’t quite that obvious in the SBC … just yet. 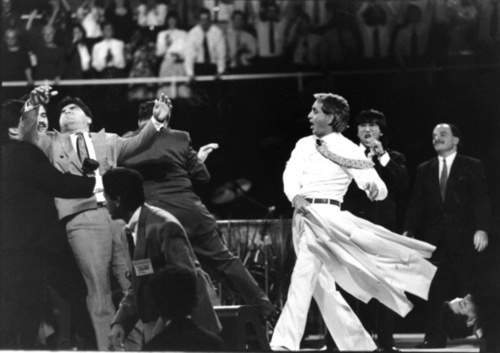 When that SBC mega-church superstar starts waving his white blazer in a Holy Ghost frenzy, you may have waited too long to find a God-honoring, Scripture-obedient church. Supportive of the tongues issue in the IMB – and that it might represent a “one step at a time” approach to lifting even further any allegiance to the sufficiency of Scripture – might have been recent SBC Presidential contender J.D. Greear. While the press swirling about the election focused on the Calvinist (Greear) vs. Arminian (Gaines) as they sought to replace IHOP pal Ronnie Floyd (oh, gee, there’s another SBC link to anti-biblical ecstaticism and charismania, huh? Repeat after me, C-L-U-E.), no one seemed to pay any attention to what the two contenders had in common. They each support extra-biblical revelation. Greear, pastor of Summit Church in NC, supports the charismatic gifting of tongues and endorses the use of a private prayer language. Attached to this article is a PDF from Summit where he leads his congregation through a teaching on tongues. Greear’s pro-tongues position is clear. Not only does he encourage a now Platt and IMB-approved private prayer language, Greear even teaches the heresy of contemplative “listening” prayer. As the astute student of the Word will recognize as erroneous in the charismatic movement, a Scripturally-unfounded emphasis on the Holy Spirit is replete throughout it. The chatter is about, by, and for an experience with the Holy Spirit, whereas, in Scripture, the Holy Spirit NEVER points a believer to the Holy Spirit. He always points the believer to Christ. The closing dialogue from Greear’s teaching on tongues is below, but it shows a fundamental departure from Christian orthodoxy, which then is also a fundamental departure from the teaching of Scripture. The church does not “bring” the Holy Spirit. He is the indwelling benefactor of every believer whom He has chosen to regenerate. His ministry of convicting of sin, illuminating the Word, and bringing to sanctification those souls, chosen from before the foundation of the world, (Ephesians 1:4) is clear in Scripture. What isn’t clear, suggested, or, indeed, correct from Scripture is that the Holy Spirit is at our beck and call. Summit, we need the Spirit in our church services. You have to bring Him! This is what this whole series has been about. Less of you coming to listen to me give sermons and us become more of a tabernacle for the Spirit of God! Here’s who I want us to close. I want to teach you a practice that will help you with this privately. We’ll never learn to do this corporately until you start doing it privately. That practice is what I call “listening prayer.” The practice of listening to the Holy Spirit while you pray for what He might be leading you to pray about a situation. In my prayer journal… of course, the more Scripture you know, the better this is. 3 keys to an effective prayer time: write it down; be specific; listen. Pray for 15 minutes a day and do those 3 things, and it will revolutionize your prayer life. So, the whole tongues-private prayer language thing that took place in spring and early summer 2015 within the IMB isn’t all that surprising. 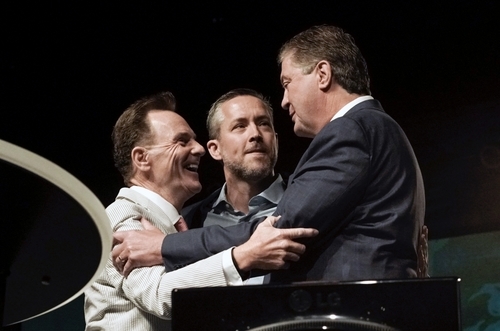 While the subsequent battle for the SBC presidency was publicly framed with the soteriological distinctions between Gaines and Greear, the underlying passion for and acceptance of extra-biblical revelation and Biblically-unsupportable tongues by them was ignored. The two candidates have much common ground on those issues. 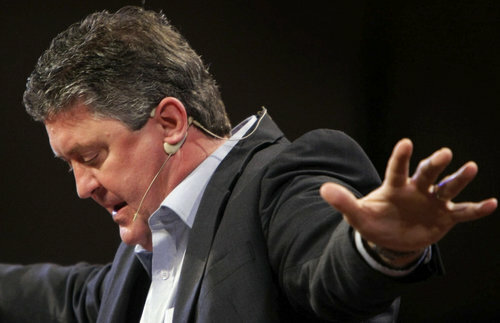 The latest eye-brow raising story then – again from the SBC’s IMB – seems like merely the next logical step for a denomination that is all too eager to embrace charismania. Many rightfully challenged the participation of Ronnie Floyd with the heretical IHOP cult, but, not more than a year later, we find David Platt extolling to the SBC’s Executive Committee the wonders of a modern day raising from the dead. Platt is cited in the Baptist Press with an unclear assessment of a reputed raising from the dead event that occurred in Southeast Asia. Platt doesn’t know if the man was really dead? Really? I find it really hard to believe that Platt might possibly find this credible. I don’t think he does, but I think the SBC tenor is one where we want to cast a wide net to fill pews and there’s a charismatic churning in the waters many in the SBC drool to bring within the fold. The last guy that we know, with certainty, that was miraculously raised from the dead was NOT a pagan village chieftain from Southeast Asia. He was in a town called Troas, in modern day Western Turkey. His name was Eutychus, raised to life by a bonafide apostle, not by an IMB trainee. Read about it in Acts 20. Platt certainly knows the story. What’s unsure is if the CP purse-string pullers care about it or not. Unless one is willing to pronounce the canon of Scripture to now be re-opened, the errors of the charismatic movement are just that … errors … that can be shown to be errors from Scripture. Tongues, in their popular presentations today, are totally unlike what the New Testament references. A “private prayer language” in which an unknowing supplicant intercedes with God in a mystery language unknown to demons or the Devil and that only God understands is ludicrous on its surface. Ecstatic jibberish uttered to God may be emotionally gratifying and warm-fuzzy-inducing, but it is neither Biblically endorsed nor edifying to the soul. Tongues, mystical, coded conversations with God in which only God is edified (umm, exactly HOW does that work, anyway? Gimme chapter and verse, please.) and modern tales of the dead being raised are 21st-century staples of Scripturally-spurious TV charlatans and false gospel, Holy Ghost hucksters. To claim that denying such things is tantamount to “putting God in a box,” it’s important to remember that “box” is one He established. He has defined how He will interact with us “in these later days,” (Hebrews 1:1-2) and it is in His Word. If that box isn’t big enough for you, you’ve obviously failed to attempt its diligent consumption. But the SBC is moving in a direction that tolerates, allows, embraces, and even teaches the legitimacy of what has been, for the overwhelming bulk of its history, verifiable illegitimate spiritual pursuits. Though the convention news may rally around the doctrinal furor of Calvinism vs Arminianism, that isn’t the real news. The real news is that a crowd-coveting, experience-eager SBC is willing to forego the teaching of Scripture to embrace endeavors far from the pages of that Holy Writ. Walk the aisles of your nearest LifeWay and peruse the mystical, contemplative tomes being hawked in that SBC affiliate and then ask yourself, just how much stock does the SBC put in the sufficiency of Scripture anyway? Just pay attention, because unwarranted and Scripturally un-mandated Holy Ghost hocus-pocus emotionalism, mixed in with spurious tales, even, of resurrections, may be coming to an SBC church near you. If and when the SBC splits, it won’t be because of Calvinism. It will be because fully half of its pastors and the bulk of its leadership are willing to disregard the authority of AND the sufficiency of Scripture. It may be blamed on “evil Calvinists” but it will really be because of Scripture-denying charismaniacs who elevate Holy Spirit experience over knowing the Risen Savior to whom He only, legitimately, and always points. But you may not hear that … unless you happen to be the tongue-tagged mystical interpreter from a forthcoming Holy Ghost revelation. Oh, and if you happen to come back from the dead under the oversight of an IMB trained missionary, write a book. I’m sure LifeWay is eager to re-open their “heaven tourism” shelves, and an SBC-sanctioned resurrection might be a sure way to silence those nagging “stick with the Bible” types.